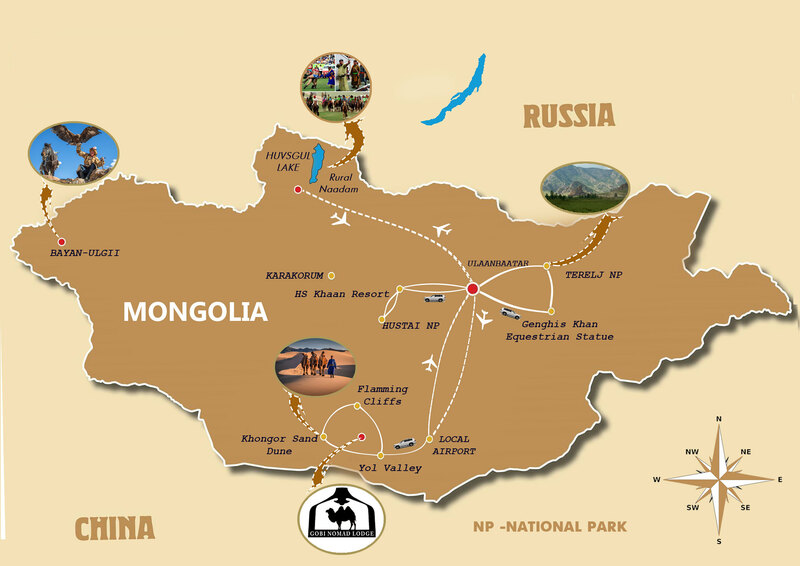 This tour includes three highlights of Mongolia travel: Khuvsgul Lake, the Gobi and Naadam festival. Tour starts from the Gobi desert, amazing terrains with large barren expenses of gravel plains and rocky outcrops and sand dunes. Your Gobi tour covers the main attractions such as Bayanzag which was named as Flaming Cliffs by Dr. Roy Chapman Andrews’ expedition because of glowing orange color the sandstone cliffs turned into at the sunset. Since the expedition discovered there the first dinosaur egg nest the world ever seen that site became a famous paleontological site; magnificent Yol valley, deep and narrow gorge in the middle of the Gobi heat, named after the endangered vulture-type bird Lammergeyer; and towering up to 200 meters high Singing Dunes, which stretches for 185 km, and visiting unique Bronze age related petroglyphs scattered over the top of the steep hill which might be challenge for you and good workout, so the walking sticks and hiking shoes are preferable. After exploring the Gobi the tour follows to the beautiful turquoise blue Khuvsgul Lake, the second most voluminous freshwater lake in Asia which holds 70 per cent of Mongolia’s fresh water and 0.4 percent of all fresh water of the world. And now time for celebrating a long awaiting unique festivity of nomads, Naadam festival in Khatgal village, southern gate to lake with population of 3000 inhabitants established in 1910 mainly for trade with neighboring Northern Siberia, Russia. Naadam is a sophisticated and eloquent expression of nomadic culture, the honored celebration of a national independence and an outstanding combination of arts and sports. Even, the core of the festival, three manly sports, the wrestling, horse race and archery, embrace many elements of arts, such as singing, dancing and performing. There’s plenty to see and do outside – food, music, crafts or just watching locals worn beautiful national costumes, meet with them and have fun together. Local Naadam festival’s schedule is the same of the state Naadam but smaller in scale but it provides up close watching and enjoyment. This is the best time to see the Mongolian people and soak up the festivity atmosphere! On arrival to Ulaanbaatar you will be transferred to Terelj national park which covers the territory over 2000 hectares and named after the rhododendron bushes which bloom in early May. Terelj NP conveniently lies in the valley of the Terelj River 80 km northeast of Ulaanbaatar. Here you will have to switch your imagination seeing the huge rock formations reminding the animals and people, for instance the Turtle Rock. We will visit Aryabal meditation center where you can learn about the Buddha’s teachings, hike and enjoy tranquility of the valley. Stay overnight at the luxurious Terelj hotel, one of the best spa hotels by National Geographic at Tola River. Our tour then goes to the fancy HS Khan resort located in an hour drive from Ulaanbaatar city. In the afternoon after enjoying delicious Japanese chef made lunch you will have an hour drive to Hustai NP to see wild horses or Przevalsky horses once died out in 1960s in the western Gobi and in early 1990s successfully reintroduced from the European zoos in the park. After visiting an information center of the park and learning about its conservational efforts and community based activities we will continue driving to the park’s areas where we can spot those beautiful wild horses ancestors of nowadays domesticated horses. Enjoy evening and morning in the luxurious ger which overlooks the vast open steppe.